The idea is quite nice: take two punk rock artists out of the context of their respective bands, give them an acoustic guitar and let each one play five solo songs. But this is actually already where the fun already ends. Flav Giorgini plays in Squirtgun, a moderately successful US punk band that had one of their songs played in the opening credits of Kevin Smith’s comedy Mallrats. Mike Scott is the vocalist of British punk band Phinius Gage and should not be confounded with the one from the Waterboys. 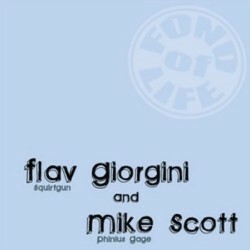 The CD starts with Giorgini’s half, who plays three solo numbers and two interpretations of Squirtgun songs. Those might be interesting for people familiar with the originals, but as I am not among them, this all sounds like a couple of really short and not particularly exciting singer/songwriter songs. Mike Scott doesn’t fare better or worse. If I didn’t know better, I’d even wouldn’t have noticed that a different vocalist has taken over the microphone. Scott offers also three of his own compositions, and two cover versions: Social, the classic hit by Squirtgun (if only because it was in Mallrats) and Good Riddance’s Shadows Of Defeat. Same conclusion here! The most interesting fact is that both artists share the running time equally, to the second precise! Apart from that, the CD is too short, but then I won’t hold that against the two artists, because this way the CD was at least over quickly. Solo guitar albums can work, but the recordings featured on this Split Series Vol. 1 just sound like hurried first take recordings, and leave me clueless as to who, apart from fans of Squirtgun and Phinius Gage, will be willing to spend their money on this record? Both artists sound definitely more rewarding in their band environments.